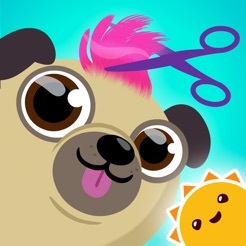 Studio POWWOW has informed us that they have just released Puppy Cuts – My Dog Grooming Pet Salon. They developed the game for The Kindly Ones Ltd. from concept right through to full release and it is published by Dublin based, StoryToys. It is out now via the App Store (see below). They specialise in all aspects of animation production and game development for TV, Film and Games. Applicants should apply via email with a CV and showreel and/or portfolio to Screen Training Ireland and Animation Skillnet at traineeship@screentrainingireland.ie with “Animation/VFX Traineeship” in the subject header. Applicants should identify the skills area/training pathway they are interested in pursuing, e.g. VFX: Compositing, 2D Animation, etc. Applicants will be evaluated and shortlisted for interview by a panel of industry experts, in consultation with Screen Training Ireland/IFB/Animation Skillnet. Only those who are shortlisted will be called for interview. 1. E3 Pass: A Conference Pass to E3. 2. Mentorship: A veteran, industry mentor assigned to the scholarship recipient based on the field of his or her study. This mentor meets with them during the conference, helps them network, and maintains a relationship with the student throughout his or her career. 3. Studio tours: In 2014 students toured DoubleFine, 3 Rings, DICE LA, Insomniac Games, and Gree as part of their IGDA Scholarships. Our program works hard to ensure students receive studio tours at each conference experience. 4. Booth Tours: This is usually specific to E3 and Gamescom. As part of this students get to play games and meet with developers one on one. During E3 2014, students met one on one with designers from Ubisoft, attended a Destiny after hours event, met with Disney, and sat down with Oculus after conference hours. 5. Q&A Sessions: We invite students to speak to veterans in private sessions. A few of the ones from the 2014 conference experiences included Brian Fargo (Fallout, Wasteland, Wasteland 2), Don Daglow (Intellivision, Utopia, Neverwinter Nights), John Romero (Doom,Ravenwood Fair, Red Faction), and Jenova Chen (ThatGameCompany, Journey,Flow, Flower). Applications for E3 2015 are due the 24th of March! In 2013 Geoff Newman (aka krudd) of EndLife Studios produced a number of podcasts interviewing people in #Irishgamedev. We also posted before Christmas that he was working on a film on gamejams. This week he released an interview with Colm Larkin, founder of Gambrinous and creator of Guild of Dungeoneering – which you might have seen on our picture carousel on the homepage! Colm should be over in Amsterdam at Casual Connect this week as one of two Irish indie games that have been selected as finalists for the Indie Prize. This interview was conducted in Dec. 2014 – so before he knew about the nomination. Thanks to Geoff for sharing it. #IrishGameDev interview with Colm Larkin from Geoff Newman on Vimeo. See also one game a month Dublin meetup. We’re an independent RPG developer founded in 1996 in Gent, Belgium. Our latest game, Divinity: Original Sin, won over 150 awards and nominations, and now we’re cooking up several follow-up projects. We’re looking to expand both our development and publishing teams. We have development positions in Quebec City, Canada & Gent, Belgium. We further have a publishing team based in Dublin, Ireland which also has some content/development positions. Talented, passionate RPG enthusiasts who prefer action and dynamism over bureaucracy and routine. We embrace people who see things differently, can teach us something new, and are ready to break the rules (in a healthy and productive manner!). We tend to stick with highly self-motivated people who require little supervision and are not afraid to experiment. Fresh ideas are our signature, and we’re looking for folks with a few of their own. – Knowledge of games and interactivity from storytelling, character development, and user engagement perspectives. You must not only play video games, but understand them as a dramatic form. Please submit a motivational letter, CV and at least two polished samples demonstrating mastery of narrative structure, character development, and dialogue. Samples should be full-length, not excerpts (Shorter forms like television or comic scripts are acceptable, but the samples should showcase an entire story from beginning to end). If you do not have professional experience, please submit at least four samples. – Support and maintain Larian websites, including Larian.com, DivinityOriginalSin.com, DragonCommander.com and future projects. – Assist as needed with marketing and other company communications that require the written word. – Ability to respond to notes and other feedback in a prompt, effective manner. Please submit a motivation letter, CV and at least ten polished samples demonstrating mastery of result-oriented graphic design and web design. Submit a CV with a motivational letter about yourself, your work and gaming experience and why you want to work at Larian to jobs_ireland@larian.com. Please provide examples of your past work. – Excellent English (journalism or other writing background is a plus). Knowledge of other languages is a plus. – You have a whole bunch of people who have worked with you, who would highly recommend you, and who will tell us they loved working with you (and be happy to provide us with that information upon request).